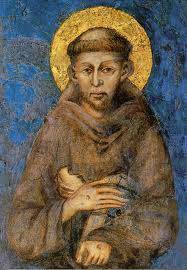 The Order of Franciscans Secular (formerly known as the Secular Franciscans or SFO) is a secular movement, founded by St. Francis of Assisi more than 800 years ago. We seek to bring the gospel to life where we live and where we work. We look for practical ways to embrace the gospel in our lives and try to help others to do likewise. Secular Franciscans follow the OFS rule that requires us to spend time in community by meeting regularly with our Franciscan brothers and sisters. We gather at least monthly. We pray together. We study and talk about the lives of St. Francis and St. Clare and other Franciscan saints, as well as deepen our understanding of Franciscan spirituality. We are called to action, a call that we embrace joyfully. Many of us have apostolates in our parish and in our community. As a fraternity, we take action on issues that affect the lives of others. We support the efforts of our brothers and sis­ters who are serving the poor. Anyone who is interested is invited to attend a fraternity meeting. In addition to attending fraternity meetings, you will have a period of formation that is divided into three stages to allow you to discern your call prior to formal profession as a Secular Franciscan. The first stage is orientation which lasts about 3 months; next,the inquiry stage which typically lasts six months, and finally a candidacy period that lasts a minimum of 18 months, depending on how you progress in your formation. At the end of the candidacy period, formal profession to the SFO occurs for those wishing to make a permanent commitment to Franciscan life.